"CHAMPION", USA LUGE's OFFICIAL TRAINING SLED FOR SLEDDING FUN. PERFECT YOUR DRIVING POSITION ON THE LOCAL TRACK, BACKYARD RUN OR FAVORITE SLEDDING HILL. IMAGINE THE CROWD CHEERING AS YOU WHIZ PAST THE FINISH LINE AT SPEED AND IN CONTROL! INSPIRE THOSE FUTURE OLYMPIANS IN YOUR FAMILY WITH THIS SPECIAL GIFT - YOUR PURCHASE SUPPORTS THE ATHLETES, PROGRAMS AND FACILITIES OF USA LUGE, A 501C NON PROFIT ORGANIZATION. 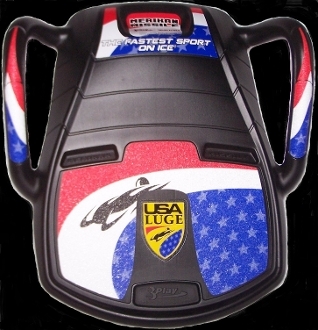 "USA LUGE - THE FASTEST SPORT ON ICE"